Fine Sculpture, Paintings, Prints, Photography | Skinner Auctions | Skinner Inc.
Skinner Inc.’s February 7th auction of American & European Works of Art will encompass a broad range of painting styles and regions. A robust selection of Old Master paintings includes an exceptional 16th Century Flemish School Diptych (Lot 302, estimated between $10,000 and $15,000). 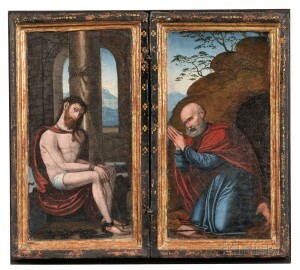 The diptych, which was most likely used for personal devotion, comes to auction through the Estate of Hester Marion Pickman of Boston and Bedford, Massachusetts. Ms. Pickman, a maternal descendant of John Jacob Astor, Sr., and her husband, the scholar Edward Motley Pickman, lived in Paris between 1921 and 1923 where they befriended such luminaries as F. Scott Fitzgerald, Ernest Hemingway, and Natalia Goncharova. Also to be offered are Jean-Victor Bertin’s Mountainous Landscape with Classical Figures (Lot 339, $25,000 to $35,000, and a striking early 17th Century French School oil painting entitled Allegory of Lust (Lot 307, $2,000 to $3,000). John Leslie Breck‘s Marsh View (Lot 421, $70,000 to $90,000) and Frederick John Mulhaupt’s Winter’s Jewels (Lot 475, $25,000 to $35,000) are highlights in an excellent group of late 19th and 20th century American landscapes. Several works by Frank Weston Benson from the family of the artist will also be available, including his oil painting, Woods, Dublin, New Hampshire (Lot 508, $25,000 to $35,000). Among the stellar illustrations up for auction are two works by Norman Rockwell, including his charming Young Love: Walking to School (Lot 593, $50,000 to $70,000), part of the popular “Young Love” series which was reproduced in 1949 by Brown & Bigelow for their “Four Seasons” calendar, and Study for Fireman, 1944 (Lot 595, $30,000 to $50,000), which was the preparatory study for a Saturday Evening Post cover image. Another notable offering is Charles M. Schulz’s I Refuse to be the One Who Tells Him! (Lot 631, $15,00-20,000), a four-panel Peanuts comic strip which was published in 1974. Leading a selection of American modernist paintings is Everett Shinn’s Paris Theatre, 1940 (Lot 516, $50,000 to $70,000), which depicts the dramatic spectacle for which Shinn is best known. Also to be offered are Alexander Calder’s Red Circus Horse, 1971 (Lot 632, $40,000 to $60,000), and Arthur Dove’s Centerport XIII, 1942, (Lot 602, $10,000 to $20,000), previously through the estate of the artist. Skinner is also pleased to offer an exceptional array of modern and contemporary paintings by renowned Asian artists from several private collections. 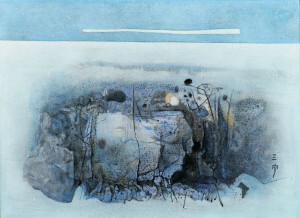 Chinese-born Xue Song’s Numbers 0-9, 2002/A Ten-Part Composition (Lot 689, $30,000 to $50,000, Cheong Soo Pieng’s At the Mouth of the River (Lot 639, $30,000 to $50,000), Tan Ping’s Yi Jianmei, a Title for a Poem and Song, 2005 (Lot 655, $5,000-7,000), and Qin Yifeng’s Line Field 431 (Lot 683, $5,000 to $7,000) are four outstanding highlights. Sure to draw excitement among buyers is one of the auction’s top two lots: a maquette for one of the earliest commissioned site-specific architectural sculptures created by Harry Bertoia – the Altar Screen at MIT Kresge Chapel, c. 1950-1955 (Lot 656, $70,000 to $90,000). 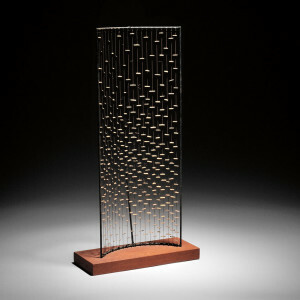 Commissioned by Cranbook colleague Eero Saarinen, the legendary suspended altarpiece screen is widely considered to be one of Bertoia’s most striking works. The model arrives from the collection of Robert Bradford Newman, who was a principal of the acoustical engineering firm which collaborated on the creation of the chapel. The Sculpture section is also highlighted by a stunning work in bronze by Frederic Remington. The Sergeant (Lot 435, $25,000 to $35,000), 1904, was acquired directly from the artist by his Yale classmate, humanitarian and philanthropist Edwin McClellan, who then passed the sculpture down through his family. From early European treasures to contemporary works, Skinner will present a wide selection of prints to suit any collector’s tastes. Old Master highlights include Rembrandt van Rijn Bust of an Old Man with a Fur Cap and Flowing Beard, Nearly Full Face, Eyes Direct, c.1631, (Lot 102, $1,500 to $2,000) and Albrecht Dürer’s Pilate Washing his Hands, from THE SMALL ENGRAVED PASSION (Lot 36, $3,000 to $5,000), 1507-1512. Among the modern and contemporary prints on the block is Roy Lichtenstein’s Mao, 1971 (Lot 72, $12,000 to $18,000), signed, dated and numbered “50/150” by the artist. The lot is accompanied by the book The Adventures of Mao on The Long March by Frederic Tuten as well as the three black and red text strips with which the print was originally packaged. The first section of Fine Photography curated by specialist Michelle Lamunière includes a representative group of iconic photographs from the 20th century. 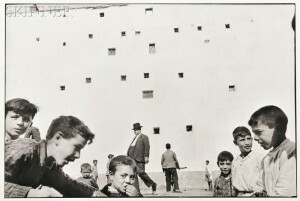 Top lots include Henri Cartier-Bresson’s Madrid (Lot 137, $8,000 to $12,000), 1933 (printed late 1990s/early 2000s), in addition to Paul Caponigro’s Portfolio II, (Lot 136, $8,000 to $12,000), printed in 1973. The latter is numbered “thirty-six” (of 100) and features eight prints signed by the artist, in the original brown folding case with ties. An excellent selection of Manuel Alvarez Bravo’s work is led by Tumba reciente (Recent Grave), 1933, printed later, (Lot 130, $1,500 to $2,000) and De La Caminata, (Of the Walk), an unusual color piece (Lot 132, $1,500-2,000) from c. 1940. Both are signed by the artist. Two works by Robert Frank will be offered, as well, including a later print of New Jersey, 1954, (Lot 151, $2,000 to $3,000). 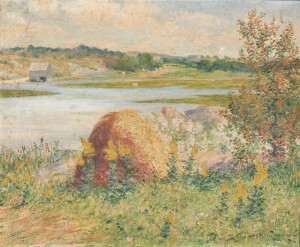 Bidders can also preview the online-only lots in person during the regular Boston preview hours. Previews for all three auctions will be held on Wednesday, February 5, from noon to 5 P.M., Thursday, February 6, from noon to 8 P.M., and Friday, February 7, from 9 A.M. to 10 A.M. Illustrated catalogs are available from the Subscription Department, at 508-970-3240, or from the Gallery. Prices realized will be available online, at www.skinnerinc.com, both during and after the sale. The Skinner website enables users to view every lot in the auctions, leave bids, order catalogs and bid live, in real-time, through SkinnerLive! This entry was posted in News and tagged Albrecht Durer, American art, american landscape, Asian Art, by Henri Cartier-Bresson, Cheong Soo Pieng, Chinese paintings, Contemporary Art, contemporary artists, contemporary asian art, european art, fine art, Fine Paintings, Fine Prints, fine sculpture, Frederick John Mulhaupt, Harry Bertoia, John Leslie Breck, landscape painting, Manuel Alvarez Bravo, Michelle Lamuniere, modern art, old masters, Paul Caponigro, Photography, Rembrandt van Rijn, Robert Frank, Robert Motherwell, robin starr, Roy Lichtenstein, vintage posters, Xue Song by Skinner. Bookmark the permalink.